An archival interview with Namit Das, in which the actor-singer of the Mumbai stage looks back at his musical legacy. My earliest memories take me back to Mahim, to the house where we used to stay, Makrand Seh Niwas. It was the first house we had shifted into, as paying guests, when my father (ghazal singer Chandan Dass) arrived in Mumbai. Everything took place with the sea as a backdrop — my father’s riyaaz, my trying to mimic him on the ‘baby harmonium’ that my mother (Yamini Dass) had bought me. It’s just the memory of a note… sa… the beginning, and everything is sort of engulfed in that — my father’s struggles as a singer, my mother’s love for her family, the sound of the sea, Victoria Library, the traffic on Cadell Road and those odd evenings in Shivaji Park where one had nothing to do but just watch Mumbai. Actually, watch Bombay become Mumbai (laughs). So very early on, you realized you were born into a musical legacy? Did you feel different from other children? Yes, I did realize that quite early but I didn’t think I was different. I was just someone who could sing. That sense came in much later when I actually wanted to be like other boys and singing was the only thing that I could do. I was often clubbed with the girls. That made me very shy. I stopped singing, stopped participating in competitions, even stopped telling people I sang. My voice was so thin that I felt I sounded like a girl. Then I hit puberty! It was the toughest time! My voice was changing and no one in the family could match my scale, I couldn’t match theirs. I tried singing alone and I sounded horrible! I wanted to sing like everyone else. My relatives made fun of me as well. Finally, one day, I asked my mother to train me. Essentially, she was my first guru. At the end of every session, I would end up crying because my voice couldn’t reach the higher registers… the sa itself was so high that by the time I reached the next octave, I was struggling to hit the notes. My mother would just push me and kept telling me to hit it higher, hit it even higher. I would keep shouting and hurting myself. One day my father heard us, and realized there was something wrong. You see, a female scale is originally much lower than a man’s. The scale that my mother used I was already singing at a higher note, which means that when she was singing in the third octave, I was already on my fourth which just made it impossible for me to reach her. My father told me that my voice was perfectly fine, I had just been doing the wrong riyaaz for a long time but it opened my voice. That’s why that joke in Stories in a Song in which Shubro (co-star Shubhrajyoti Barat) implores me to go ‘aur ooncha’ is so funny for me, because that’s what my mother kept telling me. The only difference was, I used to cry then and now the audience laughs. I don’t know if that has never happened. In that sense, Trisha (cousin Trisha Kale) was more serious about music. She had officially started learning at a very young age. I used to envy her, because she always had her teachers by her side. In fact Shubha Mudgal had met her early on, and noticed her talent. Years later, she had talked about it to Sunil Shanbag after watching his musical, Mastana Rampuri urf Chappan Churi. The Namit we see today is a very confident singing star of the stage. But I was lost, Vikram. I had never learnt music, whatever little I picked up is by listening to my dad, or my uncles, through music cassettes, then CDs and now, of course, Youtube. My learning is ‘adh kachra’ as they say. I absorb a lot, from the musical accompanists at my plays, from Shubhaji and Aneesh Pradhan who mentored us, from my co-stars Ketaki (Thatte) & Shubro. It’s all around me and I pick it up and try to make it my own. We had a very good singing troupe in college. A wonderful boy Rajesh taught me Raga Yaman Kalyan. I am still searching. Until Stories in a Song came along I had lost all hope that I would ever practice music. I thought it would be something which would be there just on the side… but the play has given me huge confidence. Having said that, I feel it’s just the beginning. 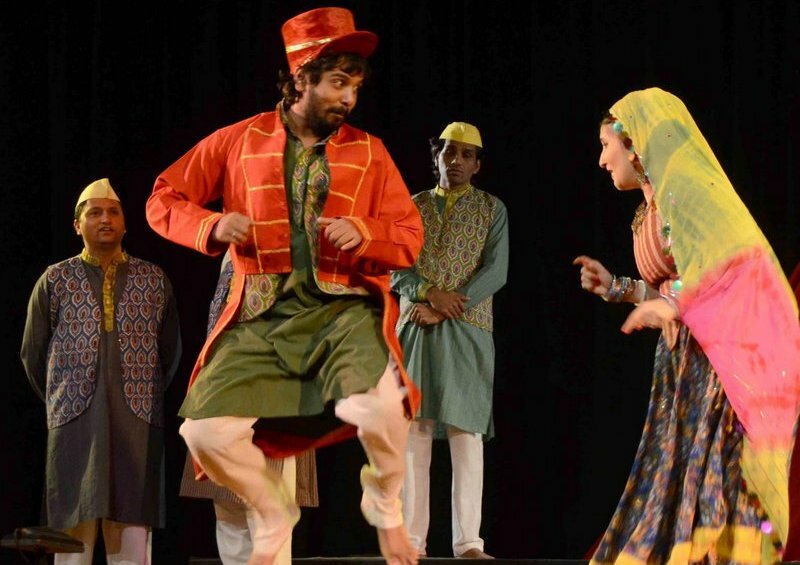 During the Mastana Rampuri… phase, did you (or anyone else in the team) forsee how music and theatre could be combined in such a fresh way as Stories in a Song showed later on? Okay… so Mastana Rampuri… didn’t do that well. It was gaining momentum with each show but something was missing. After one of the shows, at an after-party, Sunil mentioned to me that he has great plans of doing something with music and theatre. I remember very clearly that he had told me, “Namit! The energy of live music is mesmerising. I mean look at these people in the party and look at how all of them are enjoying those who are performing. Namit! I want to get this energy on stage. I want to get this raw energy working for live audiences.” That was it. He called me for his play, S*x, M*rality and Cens*rship, but I couldn’t do it because of a film. Initially I wasn’t even supposed to be in Stories in a Song, by the way. Yes, it’s so funny. I had some date issues which got sorted out very late and by then Sunil had finalised several sections. It was later that he told me that he wanted me to do a small Kajri and some part in the nautanki. I jumped at the offer… I was in Naini Tal but I just wanted to be part of this. We rehearsed for twenty days and then the Baaja Gaaja festival at Pune took place. Both those ‘small parts’ turned out to be showstoppers. I am not saying anything, I can only say I love being part of the troupe (laughs). But yes, coming back to the process, it was really Sunil’s vision that has led to this amazing transformation in theatre. Stories in a Song opened in 2011. 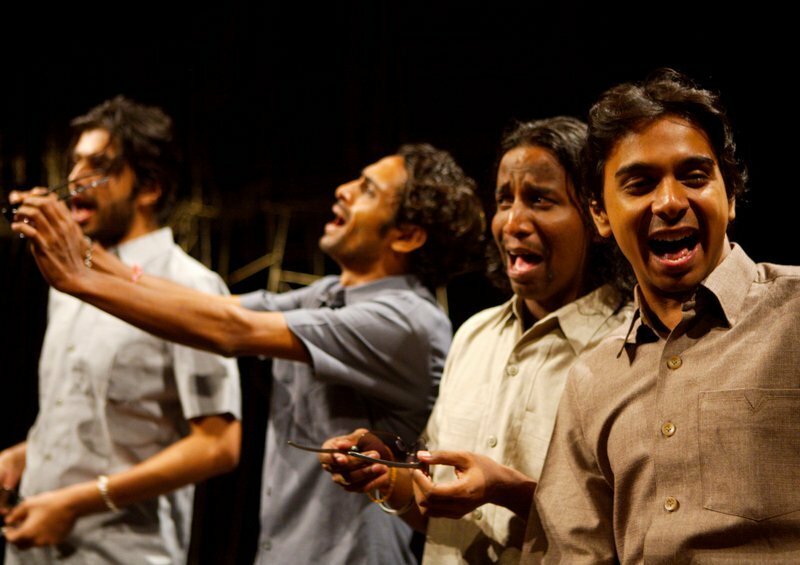 The play is still running, but the promise that it held for musical theatre in India, has it been realised? Well, this is a very difficult question. We are all still here and our journeys are still ongoing. So nothing can be a final word at this point of time. Having said that, I must say that the play definitely brought about some sort of a revolution in the theatre community. Suddenly it was important for actors to sing. Live singing became a phenomenon and I am really happy about that. But I feel that now, the time is ripe for musicians to come in, collaborations at that level need to be accomplished. You have people who sing and act but now we need people who can play music and act. We need to raise the bar now. Tell us a little about the musical improvisation in Hamlet The Clown Prince. That was a different journey altogether. It was much more basic. Each day we were fooling around with tunes when one day Rajat (Kapoor) made a face and told Puja (Sarup) and me to stick to one thing. Actually, there are two melodies, one of them has been loosely inspired by a song from Jungle Book and the other was an original. It was a lot of fun and with each show the melodies for those songs keep evolving. It’s funny but finding yourself in the same song again and again is a pleasure. It must have been interesting working with Shubhaji. Many years ago, a friend was recounting a quote apparently passed on by Gopalji (Gopal Tewari), “Acting aur singing mein farak sirf itnaa hota hai ki acting mein bolo toh aisa lage ki gaa rahe ho… gao toh aisa lagey ki bol rahe ho.” As I watched Shubhaji compose, I saw this happen in front of my eyes, how easily she would be talking through her music. She was constantly striking up a conversation while she was singing and putting words to tune. While in life she was so quiet and only had a few observations. How did the collaboration with Anurag Shanker on the Din Gaye EP come about? I’ve sung for the upcoming film Sulemani Keeda, on which Anurag was one of the composers. That was my first interaction with this really talented boy. We realised we had a family connection. He was the son of Pramod Shanker who was instrumental in giving my uncle his first big break in Mumbai. Our association has been interesting. With this EP, we wanted to bring in those melodies which have been lost forever, hence the title. This is a new journey… let’s see what comes of this collaboration. We are really looking forward to open it at the NH7 Weekender in Pune.